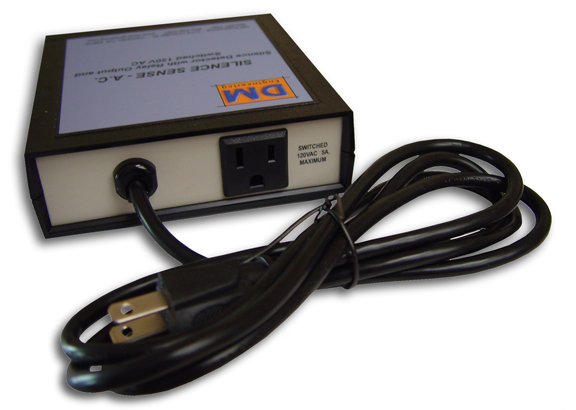 At the same time as the relay energizes, 120VAC, up to 5 amps, is applied to the NEMA “U” ground AC connector on the rear panel. The Solid State Relay will remain on continuously until audio is firmly re-established. The AC output from the Solid State Relay is not subject to the momentary and constant switch selection that controls the relay contacts. 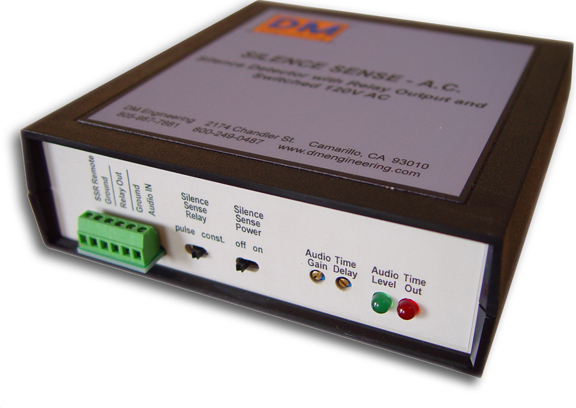 Power for the Silence Sense-A.C. is supplied by the incoming 120VAC line. Battery back-up (9V alkaline) is provided to assure operation of the silence sense circuitry and the relay contact output if the AC power fails. Both Silence Sense detection and battery back-up power are disabled when the front panel Power switch is in the off position. A set of input terminals are also provided to activate the Solid State Relay remotely, even when the power switch is in the off position. The remote operation may be from any normally open contacts such as a remote control or switch, and will provide AC output as long as the AC input power is available to the unit.